On Saturday I visited the open house for 131 Goldenrod #70 in Woodbridge. This home has also been recently profiled by Cubic Zirconia and is now pending. This 1,411 sq. ft. condo brings to mind several other condos in Woodbridge that I have seen recently. Most of them were slightly larger at 1,500 sq. ft., and listed in the $600,000 range, but they all shared a similar history of being updated, and refinished and most of them were near Woodbridge’s North or South Lakes. Significant Numbers: This new to the market 3 bedroom, 2.5 bath home is a two level floor plan at $/376 with HOA dues at $297. 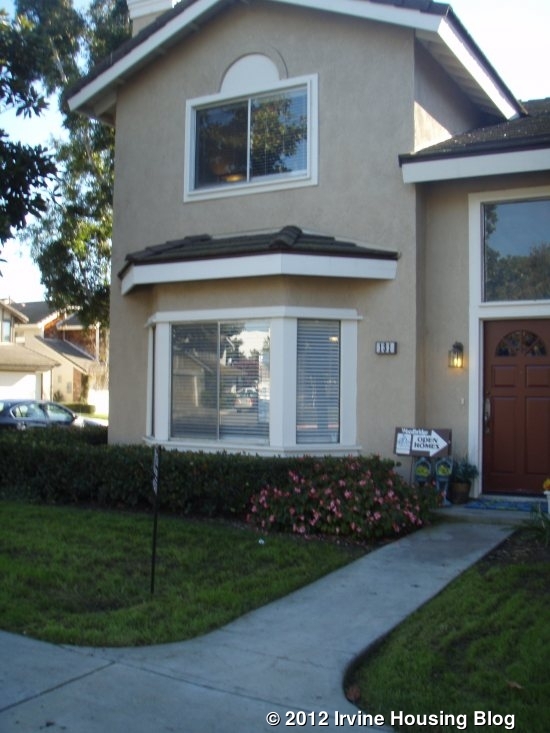 Built in 1985, It is the end unit on a quiet cul de sac in the South Lake area of Woodbridge. There is no Mello Roos tax. Close-up: The entry leads to a light filled living room with hardwood floors and a marble fireplace. 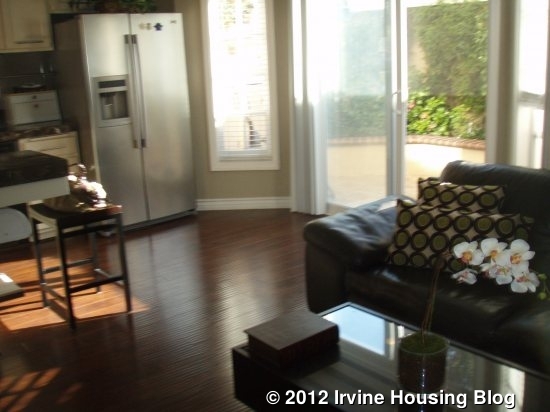 The space has room for a dining area and features a large bay window. 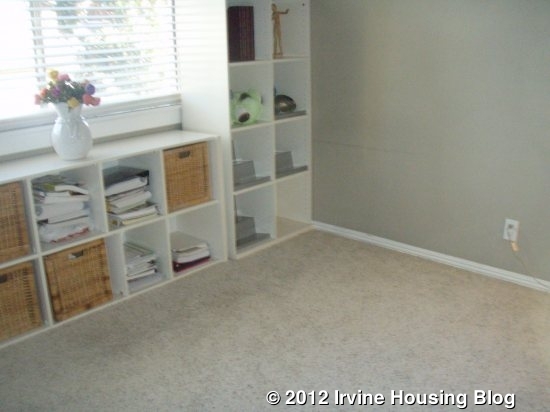 The realtor said the home is occupied, but this area was shown with a minimum of furnishings. 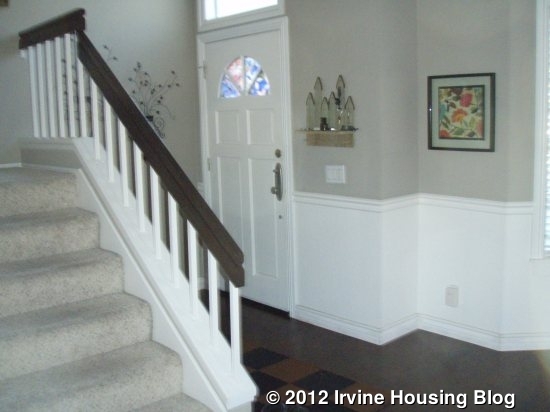 To the right, stairs with powder room underneath, lead to the home’s three bedrooms and two more baths. 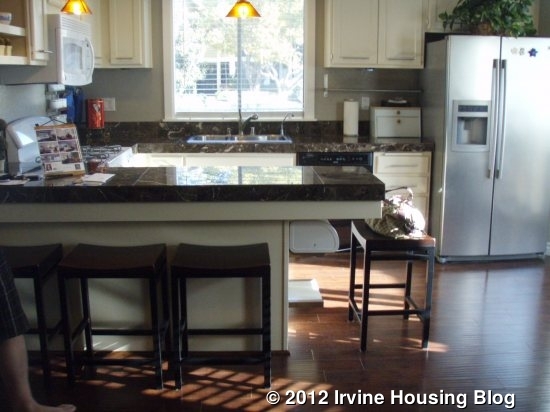 Straight ahead the kitchen pairs with a family room and leads to the covered patio and double detached garage. 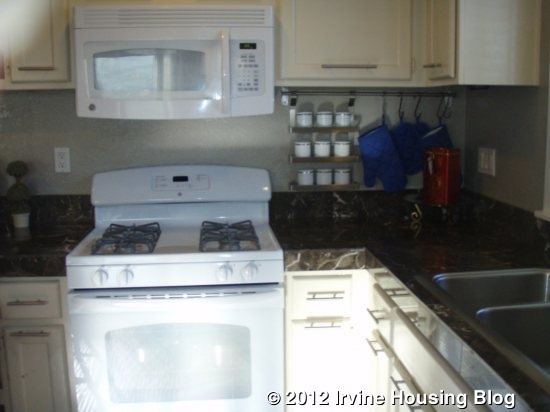 The kitchen has been updated with marble counters, a breakfast bar, and new microwave and oven. 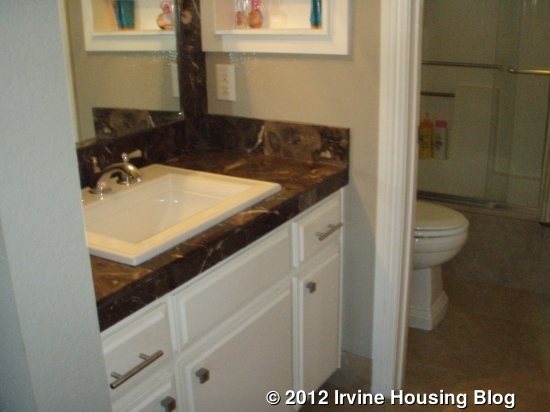 Upstairs the master suite has a walk-in closet, marble bathroom counters with designer tile flooring. The stairs and bedrooms are carpeted. Throughout the home there are scraped ceilings, recessed lighting, crown molding and designer paint. What should be considered here? The age, condition, size, two level floor plan, price, and location in Woodbridge will all be evaluated. Top schools, a small town community appeal and numerous recreational facilities will all come up too. Who will move into 131 Goldenrod #70? 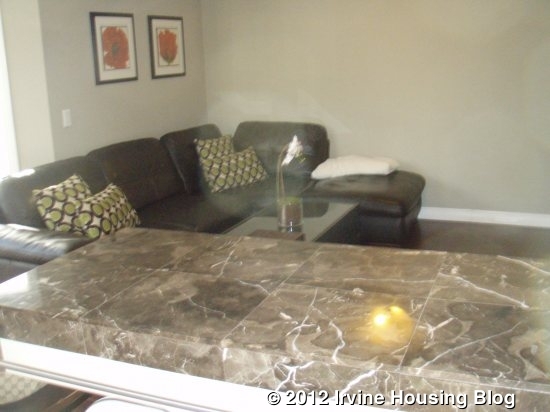 A young active family might fill the space and enjoy the surrounding community. 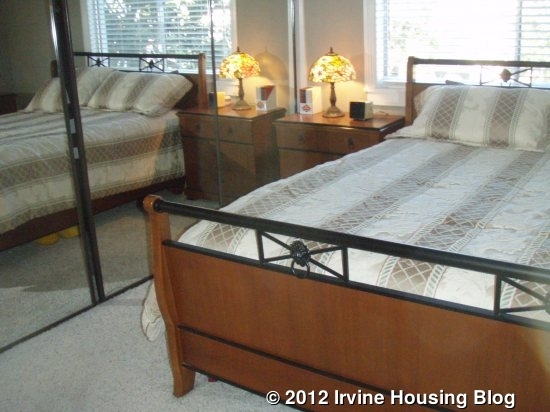 The home is within walking distance of an award winning elementary school. 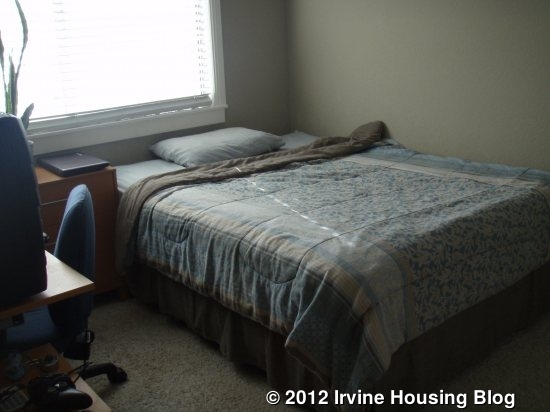 The home might also become an investment property, or operating base for a busy couple who like being in the Irvine area and need room for a home office or visiting guests. Recent listings: 420 East Yale Loop #31, $598,900; 228 Greenmoor #101, $494,900. Recent sales: 91 Goldenrod #57 sold in June for $425,000; 504 East Yale Loop #3 sold in June for $435,000. 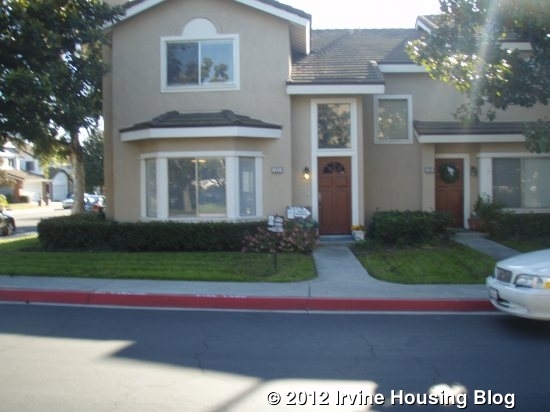 This entry was posted in Real Estate Analysis on January 2, 2013 by SMS.